The multi-functional Docu-Point Easel features a height and tilt adjustable 26"W x 33"H presentation board with storage tray. The easel adjusts to accommodate table or floor use. 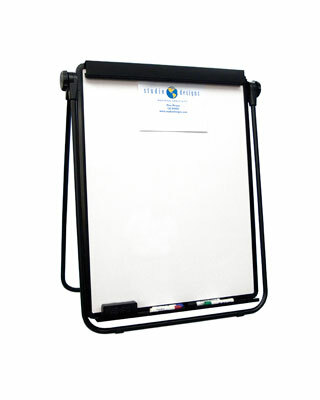 Includes a wet/dry erasable board and top clamp for securing presentation pads. Built with a durable powder-coated metal base and heavy-duty steel brackets for stability. Fits in the Studio Designs Large Easel Bag #13151 (sold separately).